Want Less Dental Work? Get Checkups With a Dentist in Friendship Heights! Did you know that an estimated 32% of U.S. adults skipped their routine dental checkups in 2016? While there are many reasons that people avoid these visits, some of the most common are dental phobia, trying to save money, and not having the time. Unfortunately, the consequences of missing checkups are spending more time and money in the dental chair and treating bigger problems down the road! 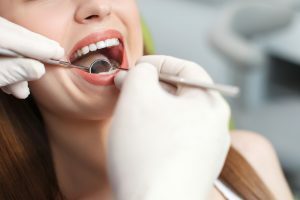 While it may seem paradoxical, the truth is that regularly seeing a dentist in Friendship Heights is the best way to actually stay out of the dental chair in the long-term. Learn more about the importance of routine care below! How Do Routine Checkups Benefit You? When it comes to maintaining any of the important investments in your life, small and consistent actions lead to better overall performance in the long-run. Whether it’s an oil change for your car or patching a hole in the roof of your house, it’s well worth the time and energy to keep small problems from getting bigger. Your teeth and gums are no different. And while many people only think of checkups as a way to check for cavities and get a professional cleaning, they’re important to your oral health for many reasons! How Do Checkups Prevent Bigger Problems? You get important screenings – It may come as a surprise, but you get an oral cancer screening at every checkup. Both your hygienist and dentist thoroughly check your throat, tongue, cheeks and lips for any suspicious lumps, bumps or lesions. As with all cancers, early detection is key. It minimizes major dental work – You might assume that you would know if you had a cavity, but many people don’t feel them until they’ve gotten larger and are close to the nerve of the tooth. Unfortunately, at that stage, a cavity might require a large filling or crown. Or, if it’s particularly severe, it may cause a serious infection and need a root canal. Checkups prevent and manage gum disease – Gum disease is one of the leading causes of tooth loss, but regular care can prevent it or manage it so it doesn’t progress to more advanced stages. Also, researchers have found that gum disease increases the risk for many serious conditions like heart disease, stroke, diabetes and some cancers. With regular checkups, you can not only have healthier gums but better overall health as well. It prevents emergencies – When a professional is evaluating every aspect of your oral health every six months, they can catch potential problems and head them off before they turn into emergency situations, which everyone can agree is a good thing. Clearly, a small investment of time and money every six months can save you a large investment of time and money down the road! Dr. Julia Lee is a general, restorative and cosmetic dentist in Friendship Heights who knows that her patients who schedule regular dental care need less major dental work than those who don’t. She always encourages each patient to come in for checkups every 6 months so she can closely monitor their oral health. If you have any questions, she can be contacted via her website or at (202) 364-8989. Comments Off on Want Less Dental Work? Get Checkups With a Dentist in Friendship Heights!